Can This East Villager Get Elected to Congress By Going to Yoga Classes and Making Coffee Dates? The space that used to house Coup, on Cooper Square, still feels like a cocktail lounge, but the young people at the bar during a recent visit were hunched over laptops instead of pints. Scrawled on three massive rolls of brown paper were the talking points of Suraj Patel, the Congressional candidate who is now using the space as his campaign headquarters. Patel’s platform, outlined on his website, states that voting should be digital, gender is a spectrum, healthcare is a right, and marijuana should be legalized. Are You All ‘LOL WTF’ About Tuesday’s Democratic Congressional Primaries? Look, we don’t blame you for spending all your time worrying that Donald Trump will win the election and then rip off that Boehner-hued mask to reveal he’s actually an electric-orange lizard person. But if you really care about the future of the country, you should be aware that tomorrow, Tuesday, June 28, is the New York State Democratic Congressional primary. It’s been a crazy, screwy, messed-up journey, but somehow we’ve made it to the future– well, almost. Some said Manhattan would be underwater before the Second Avenue subway became a reality, but by Jove (or perhaps by way of a contract with Satan himself) the MTA is finally wrapping up the first phase of the century-long project over the next several months. Or at least, that’s what we’ve been told. 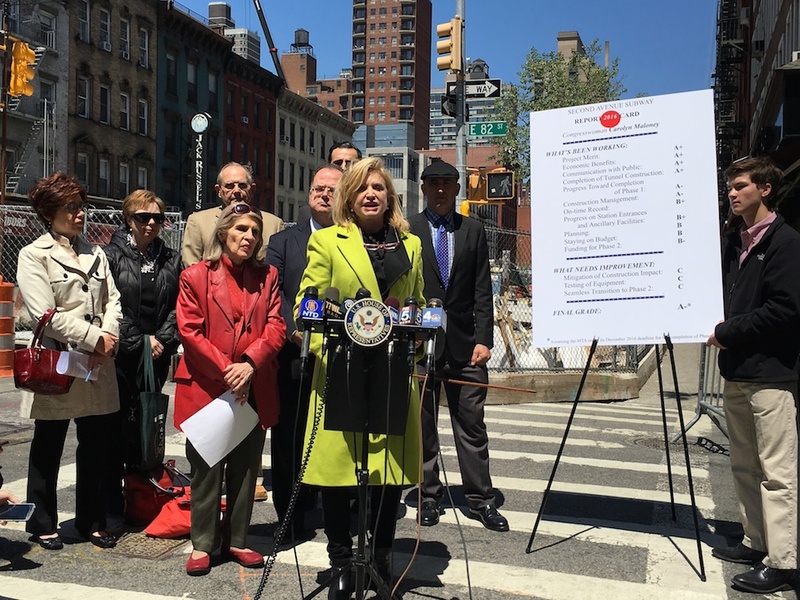 However, Congresswoman Carolyn Maloney actually checked up on the MTA’s word, and her office issued their findings in the 2nd Avenue subway “report card,” which was released today. How Many Ways Can You Say ‘Where’s My Williamsburg Waterfront Park’? 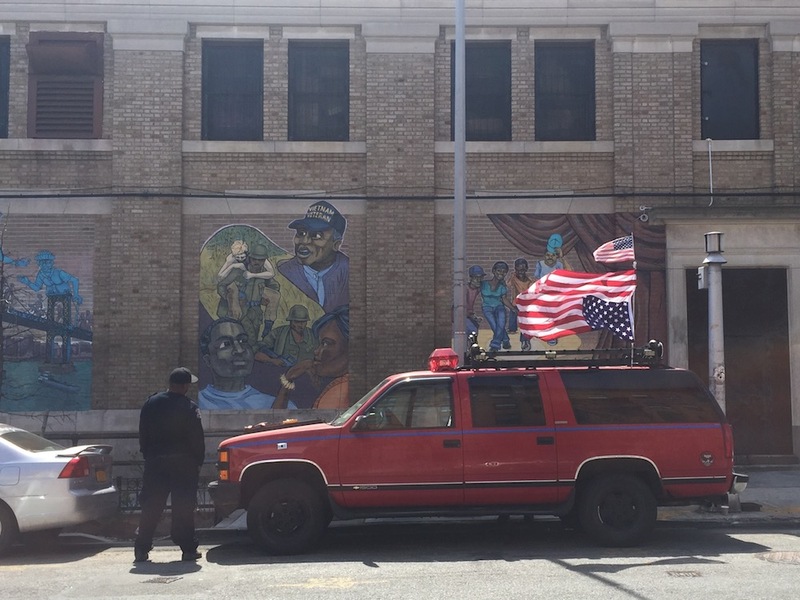 What is there to say other than, ‘Where’s our park?’ and, ‘The promise was made,’ and, ‘Do it’?” State Senator Daniel Squadron asked Sunday at the CitiStorage site, on the anniversary of a seven-alarm fire that renewed calls for the greening of the eight-acre plot on the Williamsburg waterfront. 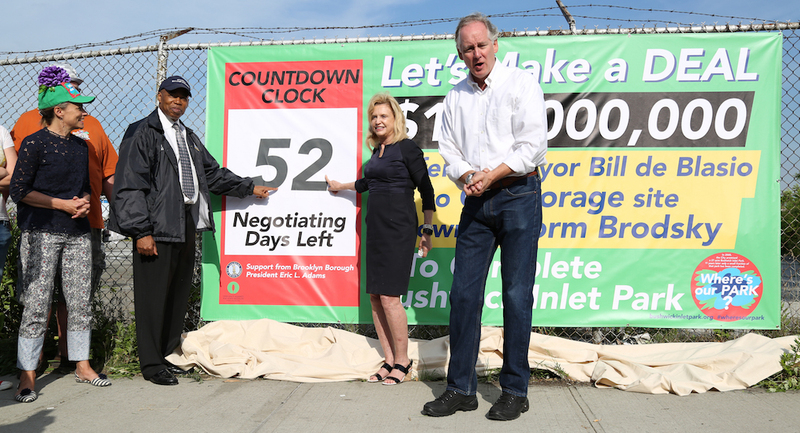 Turns out, there was more to say: the state senator was joined by Council Member Stephen Levin, Congresswoman Carolyn Maloney, and other elected officials and activists who once again called on Mayor de Blasio to acquire the land and make good on a promise made by his predecessor. So how many ways are there to say “Where’s our park?” Play the video to find out.